Master Media Design Lens-Based is a master-level course within the Willem de Kooning Academie in Rotterdam committed to lens-based image making as an art and craft. Fabian Landewee, Irma Oldenburg and Ryan Cherewaty — ranges from classic documentary, through photographic portraiture and installation work, to fully immersive moving image installations, and data-visualisation of complex scientific research. The screening at KINO is an opportunity for the general public to see some of the distinctive cinematic works made by these talented emerging film-makers. Irma Oldenburg (Nothing has to be Official), Sigrún Lýðsdóttir (Untitled), Catalina Giraldo (Sky Islands: a past time travel in the Andes Mountains), Ryan Cherewaty (Involuntary Parks) and (In Death’s Dream ) and at the beginning and end of the Graduation Program a section of surveillance footage that forms an element in a larger work by Anna-Lena Lystad, (Me and Christina) will be streamed live as audience leaves and enters the auditorium. For those of you who can’t make the first screening, a second screening is planned for Sunday 08.07 between 15:00 – 18:00. 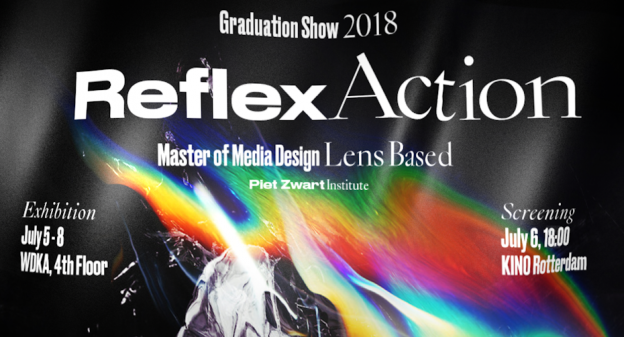 Reflex Action is part of the Piet Zwart Institute Master Media Design Graduation festival, other work by students can be seen during the WDKA Graduation Show 2018 with on Thursday 05 July the EX, XPUB presentations and performances of the Experimental Publishing Master at UBIK. XPUB is a two year PZI Master of Arts in Fine Art and Design that focuses on the intents, means, and consequences of making things public in the age of post-digital networks.